February 1 marks 80 years since the birth of Russia’s first president Boris Yeltsin who laid the foundations for Russian democracy. But was he a creator or a destroyer? And how is he remembered now? Dmitry Medvedev arrived in Ekaterinburg, Yeltsin’s hometown in the Urals, to attend an unveiling ceremony of a monument to Russia’s first president. “Modern Russia should be grateful to Yeltsin that in the most difficult period of history, the country did not turn off the road of changes, kept reforming and is moving forward today,” he said. The monument – a massive, 12-meter-tall white-marble statue weighing about 140 tones – was erected under a project by Russian sculptor Georgy Frangulyan, who is also the creator of the memorial on Yeltsin’s grave in Moscow. He says the new statute reflects the personality of the politician. “He was a man-mountain, man-rock, man-icebreaker,” Frangulyan said in an interview with Ogonyok weekly. His physical appearance, in fact, was rather impressive, too. After attending the opening ceremony, in quite a symbolic gesture, President Medvedev held a session of the presidential Council for Civil Society Institutions and Human Rights in the hometown of “Russia’s Father of Democracy” as Yeltsin is sometimes called. 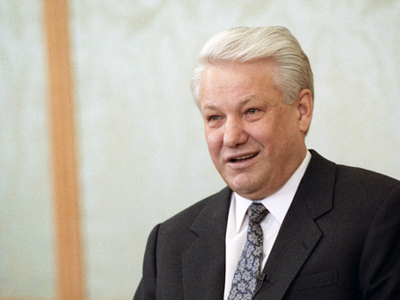 This year marks not only Yeltsin’s 80th birthday, but also 20 years since he became president. Exhibitions, book presentations, concerts and other memorial events are being held throughout the country. On Tuesday, Moscow will commemorate the First President with a special memorial ceremony at Novodevichy Cemetery where he was laid to rest. In the evening, a gala concert will take place at the Bolshoi Theatre, which Premier Vladimir Putin is expected to attend. On February 2, scientists, politicians, journalists and public activists will gather for a conference named “Yeltsin and new Russia” to try to figure out what role he played in the foundation of the country and its future development and the impact of his achievements and failures on the fate of the state. The ambiguous leader’s anniversary is yet another reason to think back to the Yeltsin Era – an epoch of huge change in Russia’s political and economic life. He served as the first Russian president from 1991 to 1999. His popularity went from 90 per cent at the beginning of his term to about six per cent by its end. Some still cannot forgive him for the break-up of the Soviet Union and the wild nineties that followed bringing many to the very edge of survival. At the same time, he gave a small bunch of people – so-called oligarchs – a large slice of the economic cake. He is also blamed for unleashing a bloody conflict in Chechnya, the aftermath of which has still not been overcome. 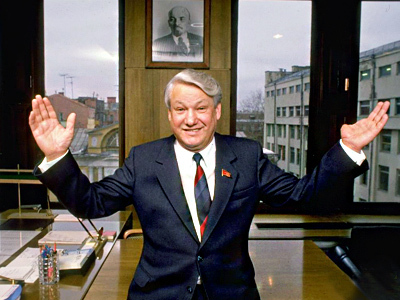 Others, on the contrary, are grateful to Boris Yeltsin for casting the communist chains off the country and paving the way to freedom and democracy.But what everyone agrees on is that Boris Yeltsin was one of the brightest political figures who opened a new page in Russia’s history. Nothing is black and white, especially when it comes to politics. And this week Russians are paying tribute to their zebra-striped past and celebrating the birthday of the charismatic leader, who died of heart failure on April 23, 2007, aged 76. Russian Communists are among those who are not welcoming the idea of the celebrations and use the occasion to remind of Yeltsin’s blunders rather than success. In line with the Soviet-era style, when winners were granted honors boards and losers had their photos placed on so-called “black” boards, young Communist supporters in Ekaterinburg made a “dishonor board” for Yeltsin. The board with the list of the politician’s wrongdoings was placed on a house where he lived back in the seventies. And that is what the Communists remember Yeltsin for: the majority of national enterprises were privatized, the quality of life for Russians dropped dramatically, 64 % lived below the poverty level, the Chechen war was unleashed and claimed 160,000 lives and the population decreased by 7.7 million. The Communist party leadership refrained this time from throwing rotten tomatoes at the Yeltsin epoch.But the party’s official website published lyrics by a controversial songwriter Aleksandr Kharchikov where Yeltsin is referred to as “public enemy” and a big admirer of the demon drink. The population’s feelings about Boris Yeltsin and his policies are rather mixed. 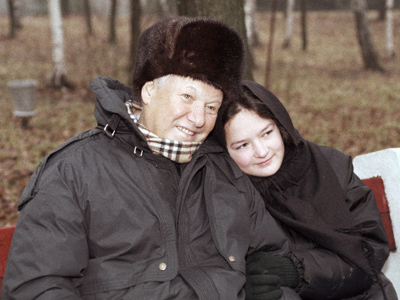 Still, more than half of Russians, 59%, are negative about Yeltsin’s epoch and the changes it brought to their lives, according to a survey published by research organization the Levada Center. Quite predictably, citizens with low income and the elderly believe Yeltsin was no good for the development of the country. Only 20% say that the first president’s policies brought positive results. But, they say, there is no future without forgiveness, and the population tends to change its attitude to Yeltsin with the passing of time. In March 2000, 53 % of Russians had negative feelings towards Yeltsin and only 7 % still supported him.Now, almost 11 years on, slightly more than a third of Russians are still not happy, thinking back to Yeltsin’s epoch, but 17 % believe the changes of the nineties had a positive impact on the state’s development.Meanwhile, 42 % are neutral and have neither good nor bad feelings. Political analyst Gleb Pavlovsky, the president of the Effective Politics Foundation, is confident that no one can give an unbiased assessment of Boris Yeltsin. “As long as his contemporaries are alive, no consensus over Yeltsin is possible, same as no consensus was possible between monarchists and republicans in France over the 1789 Revolution,” he told Interfax. On New Year’s Eve, 1999, Boris Yeltsin shocked the country and the entire world by announcing his resignation and naming the then and current Prime Minister Vladimir Putin acting president. 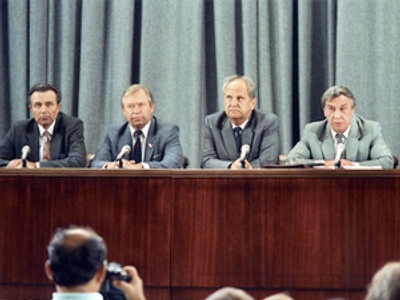 Minutes before the Kremlin clock tower struck midnight, Yeltsin said that he wanted Russia to enter the new millennium with new politicians and also new, intelligent, strong and energetic people. “I understood that I have done the main job of my life: Russia will never return to the past. Now Russia will always be moving only forwards. And I should not stand in its way, in the way of the natural progress of history.” In his touching and sincere speech the president asked the nation to forgive him for many “common dreams” that did not become reality and for not living up to expectations of the people. Recalling his surprise move, Yeltsin’s former spokesman Sergey Yastrzhembsky says that the president’s statement was largely undervalued, especially in Russia. Last year, on the eve of the anniversary of the 1991 August coup d'etat which resulted in ousting Gorbachev and proclaiming Yeltsin the new head of Russia, his biography by Boris Minayev was published. 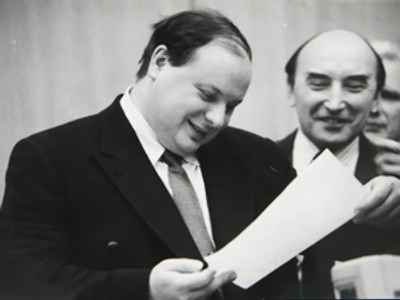 And his successor Putin – revealing yet another of his countless skills ranging from flying jets to singing – wrote an introduction to the book.The now premier said he could not judge Yeltsin impartially. “….when Yeltsin’s presidency was coming to an end I saw a different destiny for myself. But everything turned out differently. And that was the choice of my life. The choice made thanks to Yeltsin,” Putin wrote. He recalled that when Boris Yeltsin was leaving the Kremlin, he stopped for a second, looked at Putin and said: “Take care of Russia”. And here starts another book that is yet to be written.